After a great night’s sleep at the Tenaya Lodge, I woke up excited this morning for our trip into Yosemite National Park. The park is definitely one of America’s crown jewels of the National Park System. Dad was nice enough to bring breakfast to the room for Mom and me. Then we headed into Yosemite via Wawona Road. We passed by the historic 19th century Wawona Hotel. We stopped nearby at the nearby Pioneer Yosemite History Center, a collection of historic buildings, located just over a covered bridge from the hotel. Then it we drove on the beautiful ridge on our way to Yosemite Valley. It wasn’t long afterwards that the magic came back. This was at least my fourth trip to Yosemite, but the awe inspiring moment was just around the corner. We passed through infamous Yosemite Tunnel and with light appearing at the end of the tunnel, the whole valley opened up before us. It was jaw-droppingly beautiful, so we pulled over at the Tunnel View overlook. El Capital stood before us as a sentinel guarding the valley floor on the left while bridalveil falls crashed from the cliffs on the left. 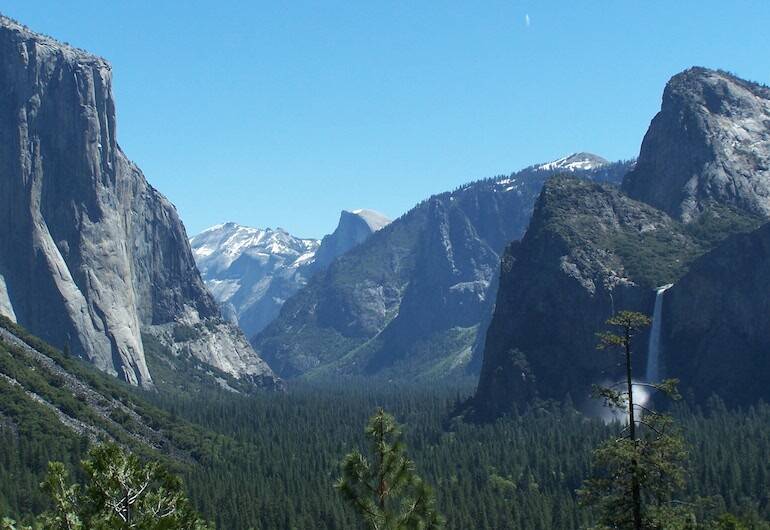 Before us the entire valley open up under a bright blue sky with Half Dome appear in the distance. This view never gets old, possibly even better with age! We were in awe again of one of the most beautiful places in California. We could stay all day at this spot, so after the obligatory photos, we drove down to the valley. We stopped at a parking lot to hike up to Bridalveil Falls. We drove past Cathdral rocks on our right as the Merced River roared with high water to our left. 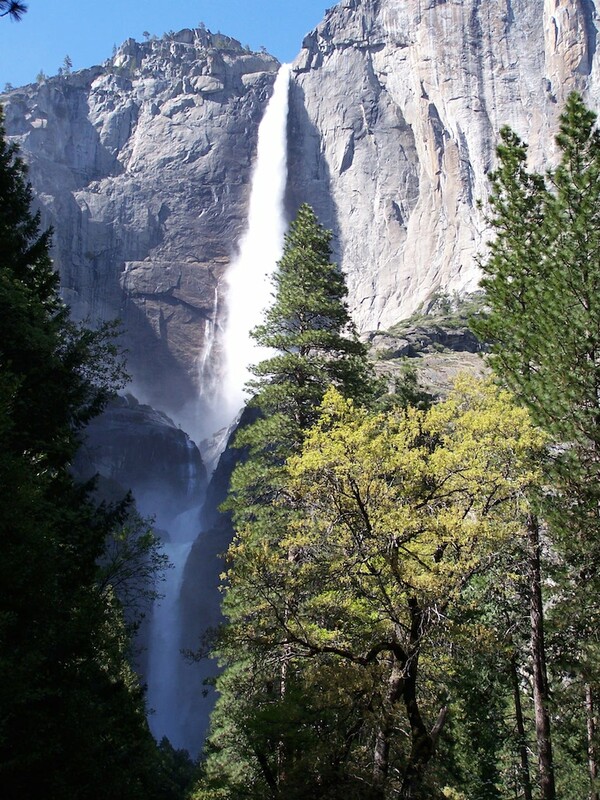 When we reached the Yosemite Valley main area, we headed for the Ahwahnee Hotel. I had been by this historic icon before, but had never been inside. 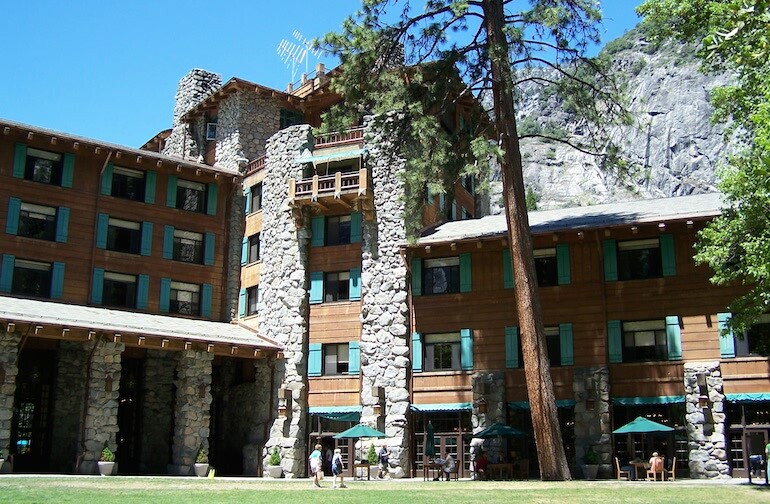 The Ahwahnee is a National Historic Landmark, built in 1927 of a rustic style with American Indian features. Its wood-like facade is actually concrete, poured into rough-hewn wooden forms and stained to look like redwood. It contains more than 5,000 tons of stone, 1,000 tons of steel, and 30,000 feet of wood. In the lounge, we saw historic paintings of Yosemite, stunning stained-glass windows, and woven tapestries decking the walls. Then we had a reservation for Mother’s Day brunch in the magnificent dining room. We had what amounted to a high tea of amazing side courses and desserts. We enjoyed beautiful views of the valley while dining. After lunch, we went outside to see the fantastic views. The sun beautifully lit up the façade of the stone structure outside as we looked towards Half Dome, Yosemite Falls and Glacier Point. Afterwards, we visited the Valley Visitor Center. We visited the bookstore before watching the “Spirit of Yosemite” film. We enjoyed seeing the adjoining hall’s exhibits about the park’s geology, plant and animal life, and history. 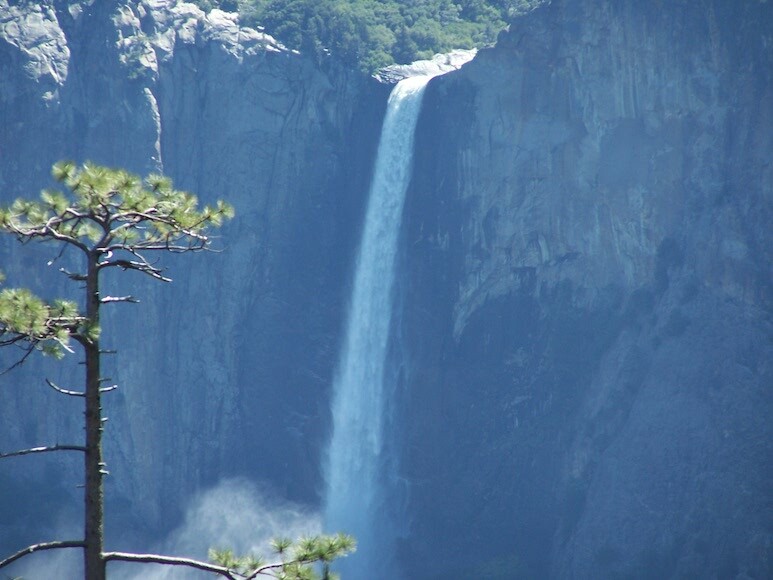 Then we walked to Yosemite Falls, two of the most beautiful falls in the world. The May runoff was epic and I had never seen so much water before. The misted drifted on you half a mile away and the roar was tremendous. We walked up to the trailhead to Lower Yosemite Fall. The water even got us soaked if we decided to stand on the bridge over the river at the bottom! 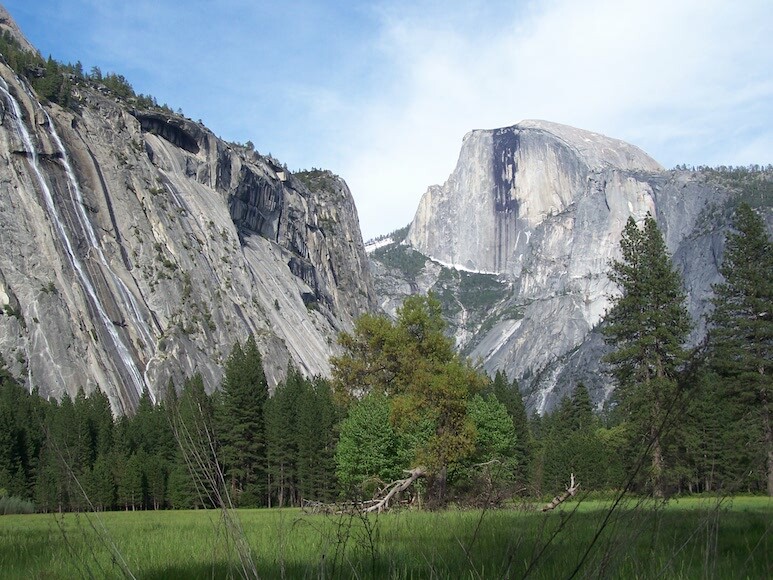 Then we got in the SUV and drove to El Capitan Meadow. 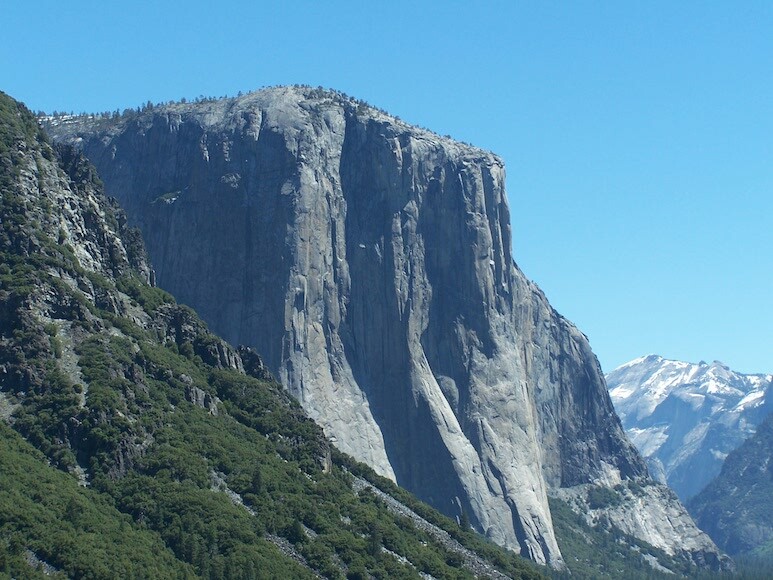 We stared up to see El Capitan towering more than 3,000 feet above us. We saw some climbers through Dad’s binoculars scaling the giant. We also admired Cathedral Rocks. On the way out, we stopped at a meadow called Valley View. This happens to be one of Dad’s favorite spots along the Merced River and a meadow in front of us. We stared at Yosemite Valley, El Capital the Cathedral Rocks and Bridalveil Falls all directly in front of us. On our way out of the park, we stopped again at the Tunnel View overlook for another view. Headed towards the park exit, we passed back through Wawona on our way to the Mariposa Grove of Giant Sequoias. 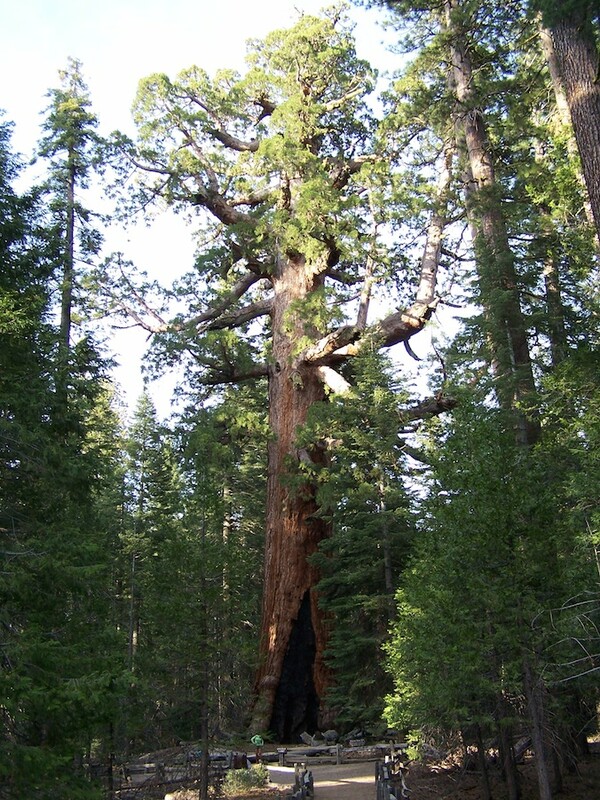 Located about an hour south of Yosemite Valley near the South Entrance, the Mariposa Grove is the largest collection of giant sequoias in Yosemite. 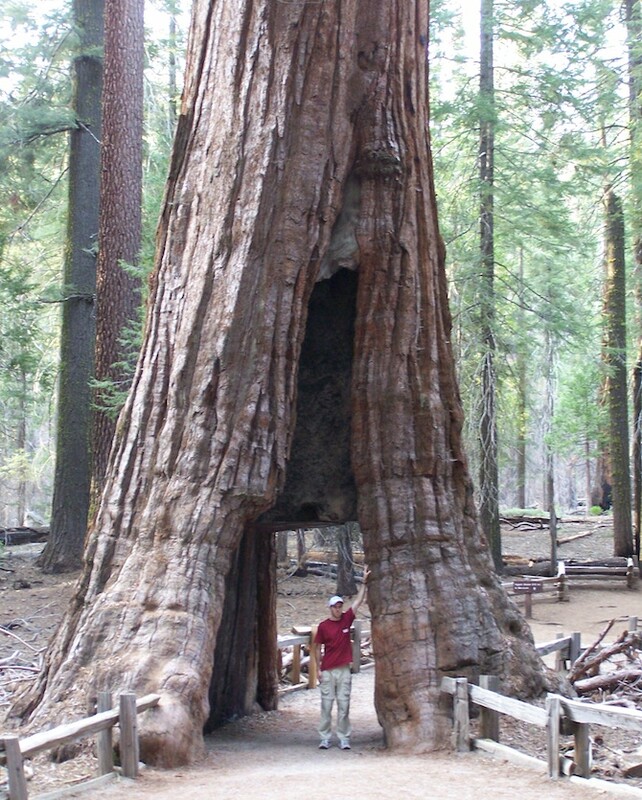 It contains about 500 mature giant sequoias, possibly the largest living things on Earth. Some are thought to exceed 3,000 years in age. They are cousins to the coast redwood found at Redwood National Park, also in northern California. We hiked to a few groves from the parking lot. Mom joined us for the 1-mile walk to the Grizzly Giant and California Tunnel Tree. The Grizzly Giant was around before Christ and is always a wonder to see. After saying goodbye to the trees, we exited through the main Mariposa entrance back to the Tenaya lodge where we had dinner. It was a great day in one of the most beautiful parks in North America.